Five weeks at Exeter Summer have taught us that whether from New York or the Netherlands, people all over the world have much in common. Just like language, though, the education systems students follow are vastly dissimilar. I am part of my 800-student class of sophomores at Stuyvesant High School in Manhattan, New York City. With an acceptance rate of under three percent, my high school is not known as an easy institution. Commute: Each morning, I depart my house at 7:50 a.m. and ride the subway for forty minutes, transferring once to the Chambers Street stop. I have first period free, so I begin class at 8:45. Classes: During my freshman year at high school, I took Global History, Freshman Composition, Advanced Biology, Geometry, and French. It is a New York State requirement that all students must take an Arts course, so I took one semester of Art Appreciation as well as Band, a full-year elective. Day in the life: I start my forty-five minute classes from 8:45 with a four-minute break between each bell. Each student is randomly assigned a lunch period and two free periods; I was assigned period seven for lunch (12:38), and first period free, as my other free period was occupied by the Band elective. School ends at 3:35 pm, when my school’s nine floors are bustling with students racing to their sports teams and clubs. Extracurriculars: Though adjusting to the workload and intensive courses of high school was challenging, participating in extracurriculars allowed me to meet new people, pursue my interests, and direct my mind away from stress. The first extracurricular I joined was my school’s newspaper, The Spectator. I participated in the Journalism department, writing about various events taking place within the school. I also joined my school’s student-run production, Sing!, a competition amongst our four grades. Serving in the Art Department, our team of twelve students painted the sixty by forty foot canvas backdrop to our show. After Sing!, I joined the track team, called the Grey Ducks. We trained every day, even on the weekends, but it was worth it when we placed first in our borough! Workload: Each day, about three to five hours of homework is assigned. Whether there are Biology labs to write up, novels in English to read, or Geometry problems to complete, homework occupies the majority of my evening. In China, the general academic pressure from elementary school to high school is extremely high. As students all over the China almost take the same courses, they almost have same schedule of learning — meaning students spend as much as possible time studying. The reason is that there is a big difference between China’s college admission practices and those in the U.S. 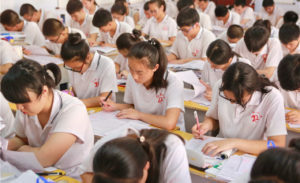 Unlike United States schools which assess a student’s ability and interests from different perspectives by viewing their GPA, extracurricular activities and so forth, all China colleges determine whether to admit a student by only one big standardized test, regulated by the Chinese education department, which is always held in early June every year for 12th grade students. The big examination has six subjects which are standardized as the textbooks are almost the same in the all Chinese high schools, and written by China’s official education department. However, there are two choices of which subjects to take. One is more inclined to social science, including Chinese, Math, English, History, Geography and Politics while the other is inclined to natural science like Chinese, Math, English, Biology, Physics and Chemistry. Obviously, the first three subjects are the same, indicating all students must take those three basic subjects in Chinese high school. The overall points of the six subjects test add up to 750 scores. Generally, the students choose to take which test in their 10th grade and they would be divided into two types of classes as the tests required. If you choose to take the first type of test, you would study History, Geography and Politics besides the three basic subjects, but you can not, and do not have time to, study Physics, Chemistry and Biology. Some people may be surprised: why can’t students not learn them at the same time? That is because when the all assessments of college are just based on taking one exam, the tests of each subjects are becoming extremely complicated and difficult.The students do not have energy to balance all and as it is, they always devote all their time to immerse themselves in practice questions besides sleeping and eating if they want to get into top universities in China. The practice paper for students in high school could be described as hill – that may be one of the reasons why the general math problem-solving level of Chinese students is usually high. Many students spend as much as possible to do the paper and solve questions by sacrificing their social life, shorten sleeping and so forth. Also, high school always begins before 7.30 a.m. and ends about 10.00 p.m. Some diligent students have even longer hours! There are almost 10 million students graduated from Chinese high school each year while the top universities only admit thousands of students so the competition to get into university is extremely intensive. And it is only based on academic subjects. There is no consideration for special talents or prizes in most cases. Although some students develop the skill of playing piano when they are young, most of them would drop it due to high-pressure studying. In addition, while in most U.S. families, students may spend lots of time on sports in their spare time, in China students’ summer holidays and weekends are always filled with Math training courses, English training courses and so on outside school as students do not want to be left behind. Above all, compared with U. S. overall assessment of a student’s ability, just as Emma mentioned above, Chinese colleges only focus on students’ academic performance in specific subjects and one test. If you coincidentally perform badly in the only one chance you get, you you would be sent to a much inferior college. Chinese students can not apply to as many colleges as they want. The Education department divides all Chinese colleges into different levels — students can only sign up for one school for each level. So if you have not reached the score line of the school you have signed up in the first level, although you reach the score line of the other school in first level, you could be only be accepted at a school on the inferior level. But certainly, each education system has two sides. What really matters is if you are diligent and determined, wherever the environment you are in, you would be successful at last.